This blog was launched in 1 November 2006. A year after the launch I described The First Year of the UK Web Focus Blog. The following year I provided a summary of The Second Anniversary of the UK Web Focus Blog) in which I provided a link to a backup copy of the blog’s content, hosted on Scribd. In a post on The Third Anniversary of the UK Web Focus Blog I commented that “with over 600 posts published on the UK Web Focus blog, I can’t recall all of the things I have written about!“. In 2010 a post on Fourth Anniversary of this Blog – Feedback Invited provided a link to a SurveyMonkey form and I subsequently published a post which gave an Analysis of the 2010 Survey of UK Web Focus Blog. Last year’s anniversary post, entitled How People Find This Blog, Five Years On concluded that “most people now view posts on this blog following alerts they have come across on Twitter rather than via a Google search or by subscribing to the blog’s RSS feed“. I went on to say that “to put it more succinctly, social search is beating Google and RSS“. But what do usage statistics now tell us about the previous year? Looking at the referrer statistics for the last 365 days (as illustrated in Figure 1) it seems that WirdPress.com has changed how it displays the referrer statistics compared with last year. Last year’s findings (illustrated in Figure 2) had Twitter in first place, followed by Google Reader and the UKOLN Web site. However this year we find Search Engines in first place, by a significant margin. my stats from the last year show a lot of Twitter referrals, but also (following a three or four day experiment by WordPress a week or so ago), inflated referrals from “WordPress.com”. The experiment (or error?) that WordPress ran was to include RSS counts in the stats. The ‘normal’ stats are page views on wordpress.com; the views over the feed can be found by looking at the stats for each page. 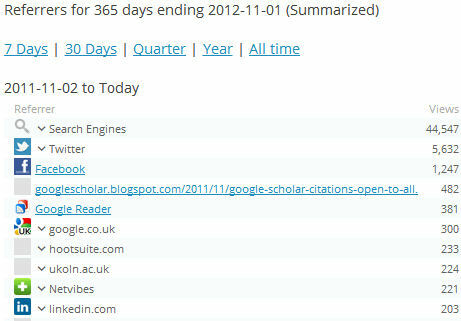 It would appear that last year’s conclusion: “social search is beating Google and RSS” was incorrect. In fact Google continues to be significant in driving traffic to this blog. However I think we can say that “social services, especially Twitter, are beating RSS readers“. The importance of Twitter is widely appreciated as a means of ensuring that the intended target audience – those with whom you are likely to share similar professional interests – are alerted to your content. But the thing that surprised me was the importance of Facebook – in third place behind Search Engines and Twitter in referring traffic to this blog. An obvious one. What I do is share the post both on my personal wall and on my fan page right after publishing the article. I appreciate that use of Facebook won’t be appropriate in all cases, but for blogs provided by individuals who have a Facebook account and who wish to see their content widely viewed, it would appear that Facebook can have a role to play in supporting that objective; the evidence is clear to see – even, or perhaps especially, if you’re not a fan of Facebook.